I can't really imagine many people from Bromley wanting to travel all that way to use Crossrail when there is a fast and frequent service from Bromley South to Victoria. A few thoughts having had time to digest things. Always good to see routes being double decked, the 291 is long overdue, the 178 seems a fairly quiet route though and from what I've seen the 244 only gets really busy between Woolwich and Broadwaters. The route through Woolwich is unsatisfactory and I don't see why this route needs to go to North Greenwich when the 132 and 486 offer quicker alternatives. 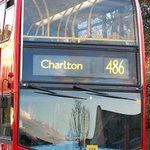 I would suggest it be replaced by a route coming into Woolwich from the east, maybe the 301 if it get double deckers? I can't fault the 301 proposal at all apart from the obvious question about why not double deckers if there is no restriction of any kind? The withdrawn bit of the B11 is covered by the 301 so no problem there. All positive, a more direct route to and from Thamesmead and a useful link to Abbey Wood. All good although is the Belvedere Industrial Area section being abandoned? Is there a case for extending the 428 there from Erith? All good, an alternative to the 108 between North Greenwich and Lewisham. I would extend it further to Bromley replacing parts of the 199 and 320 but that's another subject. Seems good, I do wonder if it should via the 99 route between Upper Belvedere and Erith giving The Quarry a direct link to Abbey Wood? The contentious bit is the reduction between Woolwich and Greenwich, there's always a trade off when new rail links are introduced as with the 427 in the west. I can see TfL's thinking and if the 177 does struggle I think they may just dig their heels in on this one citing the alternative rail link that will probably have quite a bit of spare capacity when Crossrail opens. From random observations of the 229 it seems it could do with a frequency increase between Thamesmead and Bexleyheath, the 301 might alleviate that of course, but a reduction on the Sidcup section? A few rambling thoughts. I've done most of the routes in the area but only once although the 180, part of the 244 and 89 are gaps. 1. I can see the point of the 301 but I am sceptical as to why it has to run to Woolwich. A higher frequency shuttle between Abbey Wood and Bexleyheath strikes me as more sensible. 2. I can see the point of extending the 472 and unravelling the Thamesmead loop to reach Abbey Wood but am sceptical as to the rerouting and reduced frequency. I'd have left the B11 running to Thamesmead Town Centre as now to preserve local links in Thamesmead. 3. Double decking the 178, 244 and 291 makes sense but I wonder what length of decker can get round these routes. I also wonder what happens in Winter with the snow and ice that can badly affect the hilly roads used by some of these services. Let's hope the gritting and de-icing is up to scratch. 4. I am surprised there is no direct link from Welling into Abbey Wood. 5. I don't know enough about local travel patterns but I agree with the comments that there seems to be missed opportunities with the 469. Both of Mr Twobellstogo's ideas - Pantiles or Erith Hospital - look like good options to serve new areas without an excessively high service level. The second would still allow Erith town centre to be reached over the B12's roads. 6. I am a tiny bit surprised that TfL are axeing the Belvedere Ind Est loop working. I suspect it is just to save resources but it seems counter intuitive to me to remove access to workplaces in one place but add it just down the road. 7. I am very sceptical about the 180's diversion into North Greenwich and the subsitution of the 129 to Lewisham. Locals and their councillors are already livid about this change and I think this is going to be one of the far more controversial aspects of this scheme. I expect a battle over this one. 8. I don't know enough about the redevelopment in Erith to comment about the efficacy of the 180's extension. I am surprised that more vicious cuts to the 177 and 161 were not proposed but I guess it will be a case of "keep using them or see more changes in future". Page 5 of the technical notes is interesting. TfL's modelling suggests huge demand to travel to Woolwich from the south and east (fair enough) with smaller increases in demand to get to Abbey Wood from Thamesmead and Belvedere. You can see increases where there won't be additional help, such as along the 51 from Welling and 122/161 down Well Hall Road. But it also suggests a big drop in demand for bus services between Greenwich and Woolwich along the A206 (177 corridor), and Blackheath and Woolwich along the B210 (53 corridor). This will no doubt be TfL's justification for hacking away at bus links between Greenwich and Woolwich (although the 53 corridor remains untouched, thankfully). I've been trying to work out where this drop is coming from, but can't work it out. My only thought is that it may be journeys from Abbey Wood/Woolwich towards New Cross or Peckham switching to Crossrail and London Overground (via Whitechapel). But bus travel will remain competitive here for both journey time and cost. Am I missing something? I can't quite see the need for the 180 change. I can understand there being a worry that with the Erith extension the 180 would be quite long. With TFL predicting a reduction in demand across Woolwich to North Greenwich the reduction from every 6 to every 8 mins should be ok for that section so why the need to send the 180 to N Greenwich. Surely this will lead to more buses to N Greenwich. The central spine up Greenwich Peninsula (from the Ikea site up the doomed busway) will see just one extra bus per hour under the proposals, if I have my sums right (up from 44 to 45, not including the handful of extras on the 472 in the morning). TfL's rationale is that the predicted drop in demand from Woolwich will be replaced by new demand from new residents on the peninsula (if you've never been down there, you'll be stunned at how many Greenwich Millennium Village residents travel one stop to the station on glorious summer mornings). Oh ok. So despite them not making it that clear this was also about improving services around Greenwich Peninsula. I do think extending the 129 to Lewisham is a good thing but just worry about the reduction from Woolwich to Greenwich. Perhaps something from Woolwich could be extended to Greenwich not sure which as the 51, 96, 99 are already long enough. Out of those three routes, the 99 would probably be the preferred candidate - the alternative is to divert the 161 to Greenwich instead of to North Greenwich. But if you divert the 161 would that not leave a reduction up to North Greenwich which is needed in the peaks. It would be simpler just to leave the 180 going to Greenwich and extend one of those routes to North Greenwich although I suspect that TfL have decided that the 177 is sufficient as there will be more capacity available on Southeastern to Greenwich and beyond? I certainly wouldn't want to go from Abbey Wood or Woolwich to New Cross via Whitechapel. I suspect the thinking is that there will be plenty of space available on Southeastern services from Abbey Wood and Woolwich to Blackheath/Greenwich and New Cross, with a change at Lewisham, once Crossrail commences. I suspect it is based on commuters and not shopping trips, therefore ultimate destination is City or Midtown/West End with some Canary Wharf as employment centres. Therefore faster if get Elizabeth line further out rather than crawl on a bus to the DLR or overground. Of course there is a bit of chicken and egg in this modelling, in sense of is the bus a feeder service, or a partly trunk service, clearly round the houses buses connecting with stations are in the former, quick straight routes in latter. However there are very few sections that are exclusively one or other, so get trade offs of walking further to bus stop for the direct buses etc. Ultimately the modelling is trying to guess origin and destination and preferred change locations. In over 25 years of commuting I knew a fair number of colleagues that had a different route to work from return in evening, simply because it can be easier to get a seat or connect, and it's always better to change from a low frequency service to a higher frequency service. As an example if it is a 6 minute walk to a station, you can time it to meet the train, but at connecting point want higher frequency as less likely to have to wait long. Sometimes better to continue to next station and have high frequency service, even if that bus takes longer, similarly getting on near start of route tends to offer better chance of timekeeping than uneven gaps. The effect of this is the bus service gets used more in one direction than the other which means potentially some routes need different frequencies in morning and evening and in different directions. Very difficult to describe in a wordy consultation trying to describe modelled frequency graphs that the public don't see. Hope this explains it a bit, even if shows devil is in detail. I would like to see the option of the 428 extended to Abbey Wood by the quickest route and the 180 stay at Belvedere. Looking at the plans there is nothing to link Crossrail with Crayford where if the journey was around 25-30 mins I could easily see people making that connection.